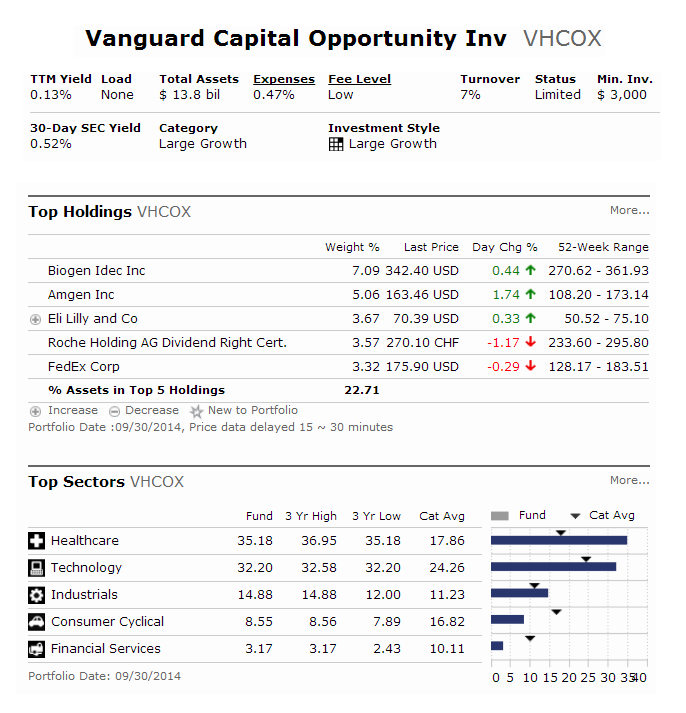 Vanguard Capital Opportunity Fund (VHCOX) is a popular actively managed mutual fund. This investment fund focuses in US stock mutual funds with growth. It uses its assets to purchase stocks of companies that will grow in time, but may be volatile in the short-term. This Vanguard fund may focus in certain market sectors, including information technology and health care, helps differentiate the fund from its benchmark and peer funds. The fund advisor is PRIMECAP Management Company. It is managed by Theo A. Kolokotrones, Joel P. Fried, Alfred W. Mordecai, and M. Mohsin Ansari. This large growth mutual fund is using benchmark such as Russell Midcap Growth Index and Dow Jones U.S. Total Stock Market Index. The expense ratio fee is only 0.47%. This investor class has 138 holdings. You can buy this fund for your brokerage or retirement account with as little as $3,000. Note: This U.S. stock fund may be closed to new investors. You may also find other classes of this mutual fund. The other classes are: Vanguard Capital Opportunity Fund Admiral Shares (VHCAX). Morningstar has ranked this international stock fund with 5 star and gold rating. In 22014, the year-to-date return is 19.12%. This equity fund has returned 26.44% over the past 3 year, and 16.01% over the past 5 year. The top 4 sectors are health care, information technology, industrials, and consumer discretionary. Top 5 stocks are Biogen Idec Inc, Amgen Inc, Eli Lilly & Co, Roche Holding AG, and Southwest Airlines Co. The price to book ratio is 3.7 times. Since its focus is on U.S. stocks, the fund can be riskier than any bond fund. In addition to stock market risk, the fund is also subject to investment style risk, and manager risk. This Vanguard Capital Opportunity Fund has a low expense fee. This fund has consistent performance for the past 5 years. It is non-diversified and may involve higher risk than typical index fund.